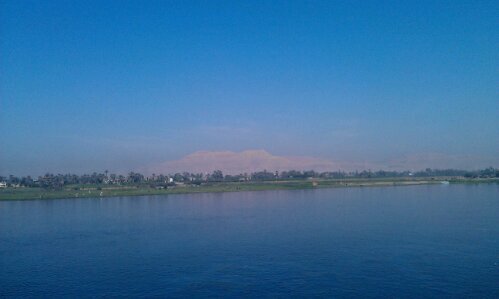 Yesterday we arrived in Egypt. It was quite a long journey to be honest. We left home at around 4.20 a.m. (me having slept 2.5 hours, Michael fresh from work, he just changed and got into the cab to the airport). The flight was at 6.45 a.m. and we arrived in Marsa Alam at around 1 p.m. local time. On the map Luxor didn’t look that far but with a seamingly detour nearly up to Hurghada it took another 6 hours by minibus to get there. So at 8.40 p.m. we finally checked in at our ship, the MS Zaina. The ship is actually quite fine. 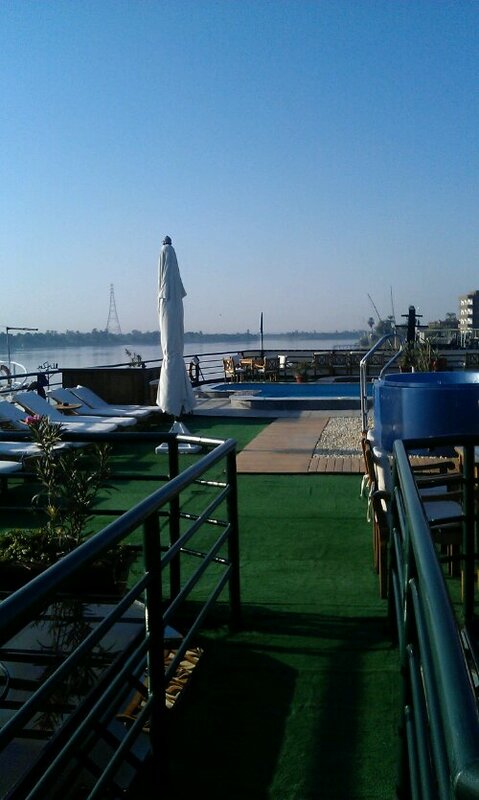 It is not brand new (new carpets would be great) and we have one of the cheapest cabins on the Nile deck, meaning we have a window which is nearly at a level with the river but that is completely fine as we only sleep and shower here anyway. The food is ok too (I have had better but also far far worse hotel food). People are nice too. It is a completely German ship but that is fine. Now today started the booked program. After breakfast we got picked up for our trip to the Karnak temple precinct in Luxor (having being sorted into a group of 30 people already yesterday). This complex consists of several temples, pylons, hyppostyle halls and a sacred lake and is know as the biggest temple complex in Egypt. And it was definitively big. But having seen Angkor Wat, unfortunately nothing seems that big anymore. The afternoon was for some sunbathing and a short dip in the pool every now and then. We drove on to the south until 11p.m. 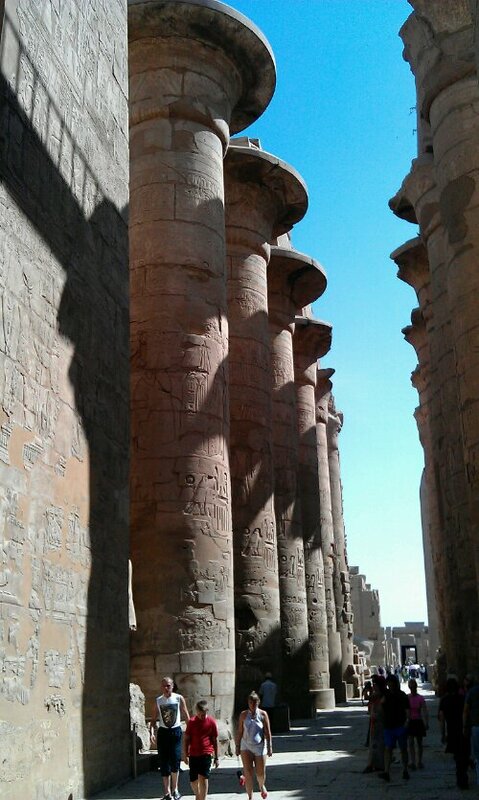 when we stopped in Edfu for the night. Unfortunately we have no internet here, so I’ll have to wait for a chance to post this. 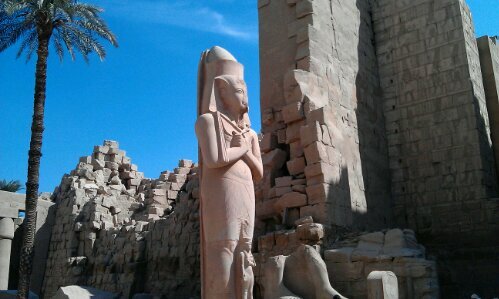 This entry was posted in Egypt and tagged Karnak, Luxor, Nile cruise, Ruins, Temple by kathatravelling. Bookmark the permalink.